Generation 2.0 RED participated in this year’s Fundamental Rights Forum, organized by the European Agency for Fundamental Rights (FRA) in Vienna from the 25th to 27th of September. Being one of the EU’s decentralized agencies, FRA serves as a center of expertise mandated to deal with the full spectrum of fundamental rights. Over the course of the three days we joined over 650 participants hailing from major European, national and international human rights organizations, EU Institutions and Agencies, local and national authorities, legal practitioners, the business, sporting and arts worlds, not to mention civil society and rights-holders themselves. 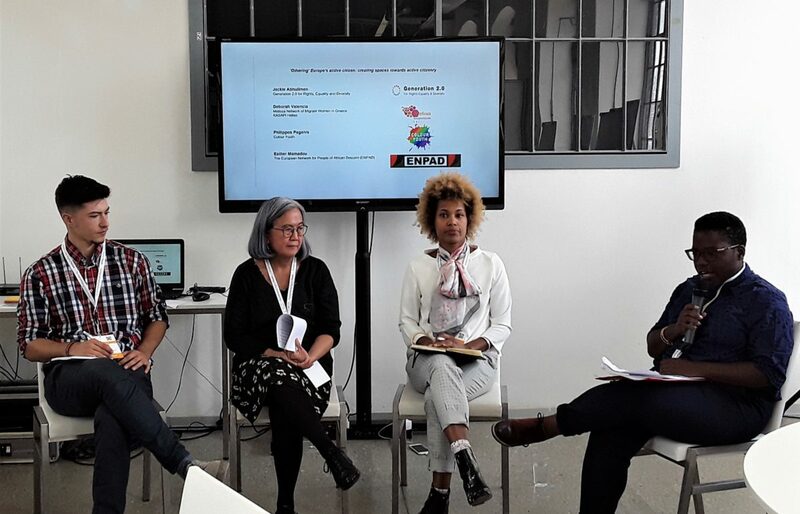 The programme ranged from plenary panel discussions and FRA-led working groups to arts-related events, a virtual zone, sports activities, and over 50 open sessions, allowing the Forum to be an interactive space for dialogue on the pressing human rights challenges in the EU. This year’s theme was ‘belonging’ and as an organization with a core belief that all of us have the right to equal and active citizenry on an individual and communal level, we put together a panel discussion on participation. Titled ’Othering’ Europe’s active citizen: Creating spaces towards active citizenry. The key point of the discussion was to challenge the predominant ideas around active citizenry, recognizing the ‘European others’, meaning the marginalized communities self-organizing and creating their own spaces. Thus, redefining the meaning and identity of the active citizen in Europe today. Deborah Carlos-Valencia co-founder of Melissa Network of Migrant Women in Greece, a network promoting empowerment, communication and active citizenship and founding member of KASAPI Union of migrant Filipino workers. Philippos Paganis, project manager of Transcending Youth- Supporting Trans Youth, of Colour Youth an LGBTQ youth group which aims to form a strong youth community, support its members and assert their rights. Esther Mamadou, Executive Director of The European Network for People of African Descent (ENPAD), a network of organizations for people of African Descent in Europe. Together, for a little over an hour, we engaged in conversations around the nuances of active participation and what that looks like in today’s Europe. Connecting the conversation back to the theme of the Forum ‘belonging’, we began with the question of why one desires to ‘belong’ somewhere. Positioning the matter of the recognition of the ‘European others’, we highlighted how this sense of belonging becomes activated exactly because to be on the margins is to be part of a group which is not catered to and whose needs are not met socially or politically. As a result their claims are not recognized; particularly those kinds of political claims directed at the state and at other citizens in relation to either race, class, gender and of course within the context of ‘migration’, claims on issues of documentation and legal status. This sense of belonging therefore has to do with claiming something which is not afforded, that is, having access and having a say. In this context, Esther Mamadou explained how it is precisely these claims coupled with the lack of spaces which creates the need for other forms of organizing, ENPAD being such. Deborah Carlos-Valencia then shared the experience of Melissa Network and KASAPI and their efforts toward self-organizing and creating safe spaces where migrants and refugees work together for the betterment of their community as well as to build bridges of communication. Philippos Panagis in turn stressed the importance of intersectionality, speaking of Colour Youth’s work in creating spaces for young people with marginalized identities to become engaged and take action while feeling safe and accepted. In this discussion Jackie Abhulimen (Generation 2.0 RED) spoke about the experience of the second generation and the movement for the right to citizenship precisely because it shows how those on the margins, including those who in this case were not even native or naturalized citizens have and continue to self-organize. In the case of the second generation, similar to other groups, the struggle was both material in terms of legal and social obstacles as well as discursive in terms of being ‘invisible’ in the public realm. Visibility however is not only about being ‘seen’, it is also about being ‘recognized’. And in this case, it was not about recognizing something ‘new’, but about recognizing a group that had already been there for so many years and yet still failed to be recognized within the constructs of ‘citizen’. The work of the communities represented by the panel, in relation to access and recognition, serves as an example of how by self-organizing and creating spaces not only are communities participating in active citizenry, but their very participation itself, that is the work that is being done, is redefining the notion of ‘active citizenry’. A notion, as echoed by all, based on the values of inclusion, equality and solidarity for the betterment of the community.